Painter, part of a French family of artists. The family s history began with two engravers: Charles [Karl] Audran (c. 1594-1674), who is thought to have trained in Italy with Matthäus Greuter (1564/6-1638) and produced much work of inconsistent quality, and his brother Claude Audran I (c. 1592-1677), who made undistinguished book illustrations and portraits. Claude s eldest son, Germain (1631-1710), was also an engraver of book illustrations and portraits and taught at the Acadmie des Sciences, Belles-Lettres et Arts in Lyon. The family s most prominent members were Claude I s two younger sons: Claude Audran II (1639-1684), a painter, and particularly Girard Audran (1640-1703), an engraver. The next generation produced artists of some distinction in three of Germain s sons: Claude Audran III, a painter, and Benoît Audran I (1661-1721) and Jean Audran (1667-1756), both engravers; the latter s son Benoît Audran II (1698-1772) was an engraver of minor importance. Claude Audran III trained with his uncles. 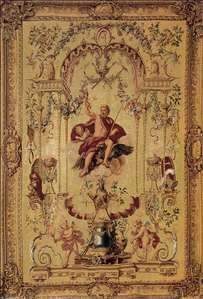 He was solely a decorative artist, specializing in painted panelling, harpsichord cases and so on; he was, however, able to renew the genre with his arabesques, grotesques and singeries. He became a master in 1692 as painter, sculptor, engraver and decorator . Payments document the variety of his talents: designing tapestries, painting on glass, executing a feu d artifice , and gilding gondolas for the canal at Fontainebleau. In 1704 he was appointed keeper of the Luxembourg, but continued to be much occupied as a general decorator and designer. He worked at Versailles, Anet, Marly, Sceaux, Meudon and La Muette. 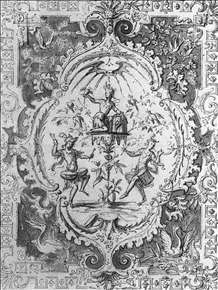 He also made many tapestry cartoons for the Gobelins, including the Douze mois grotesques (1699) and the Portieres des dieux. Among his very last work was that in 1733 for the Duchesse de Maine at Anet, where he had first been employed some time before 1698. 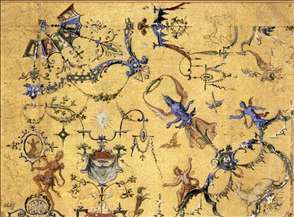 His decorations are now known mainly through his many drawings, a large collection of which is in the Nationalmuseum, Stockholm. His style influenced the decorators of the Rgence. Watteau was one of his pupils. Nowadays Claude III is most usually thought of in connection with Watteau, but he is a significant phenomenon in his own right. See more details about "The Gods: Jupiter"
See more details about "Arabesque"